Hawkeye: "I stopped having morale about six months ago." This site was created by and is maintained by David Long. Designed 1997-2019. 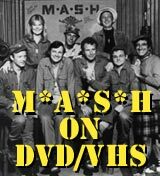 M*A*S*H is TM and © Twentieth Century Fox. Who was your favorite Captain?